President Hassan Rouhani has submitted a new budget bill to parliament for the next fiscal year, beginning on March 21, on an upbeat note despite admitting that US sanctions would affect the lives of Iranians and hinder growth. The budget of 4,700 trillion rials ($112 billion at the official exchange rate) is 27.6 percent more than the current budget in the Iranian currency, excluding the spending of state enterprises. However, that is sharply less in US dollars due to the decline of the rial this year. At the unofficial exchange rate the budget is equal to about $47 billion against $87 billion in the current year’s state budget. 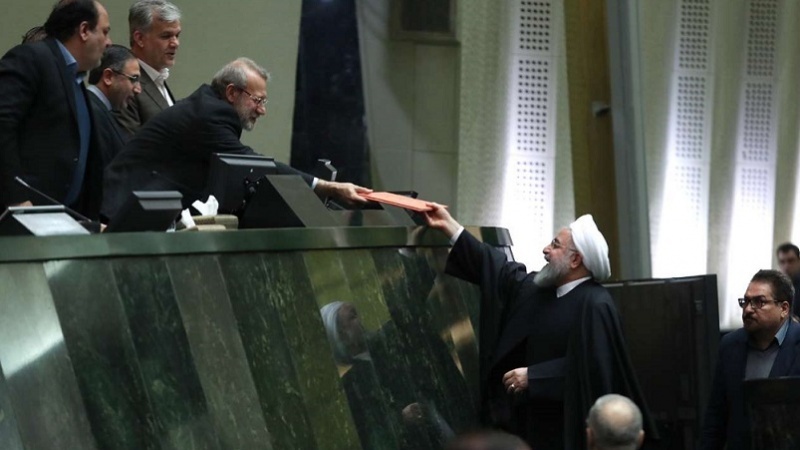 “The budget bill for 98 [the Persian year of 1398] is being submitted to the Islamic Consultative Assembly while we have been facing a situation of American pressures and atrocious sanctions since late last year,” Rouhani told lawmakers. President Donald Trump pulled the US out of an international nuclear deal with Iran in May and reimposed all sanctions lifted under the agreement against the Islamic Republic. Rouhani said the sanctions and pressures will affect the lives of the people as well as the country’s growth and development, but will not bring Iran to its knees. The president touched on the turmoil at the foreign currency and commodity markets in Iran after the US announcement of sanctions which prompted some Iranians to dump their rial holdings in exchange for foreign currencies. In 2015, President Rouhani oversaw the conclusion of the Iran nuclear accord, formally known as the Joint Comprehensive Plan of Action (JCPOA), which lifted sanctions and led to a robust economic growth of 12.5 percent the following year. “Our investment growth reached from minus 17.4 percent to plus 3.4 percent, meaning all our indicators had become positive and we were moving towards our goals by choosing the right direction,” the president said on Tuesday. That was when “the Americans implemented their evil plot to sanction the Iranian nation,” he added.